Criccieth Antiques & Collectors Fair, Memorial Hall, High Street, Criccieth, LL52 0HB. Admission adults £1.00, concessions 70p, accompanied children free. Many local facilities for the visitor to enjoy..
Join us for a range of slate-tastic activities this summer. Decorate a slate, colour your own geological timescale, get creative with the museum’s Art Cart, try your hand at making perfect patterns in the foundry sandpit or get all dressed up in the quarrymen’s houses. Something for everyone! Children’s crafts £1 per child. Craft stalls on Ffestiniog Railway Platform, Blaenau Ffestiniog. Public admission free. Arts and crafts trail in the village of Dyffryn Ardudwy, between Harlech and Barmouth. Free entry to all 5 exhibition sites, showing quilts, photography, paintings and other craft items. Sales at the Church Hall. This year’s theme is ’to Have and To Hold’ and there will be a special display at Llanddwywe church showing a hand made wedding dresses, antique and new, together withan exhibition of related items made by children from Ysgol Dyffryn. Refreshments available at 2 caves in the village. For more information see Facebook/pages/artintheaisles. Enjoying a peaceful and picturesque location, the park offers a wide range of comfortably equipped holiday accommodation for couples and families alike. 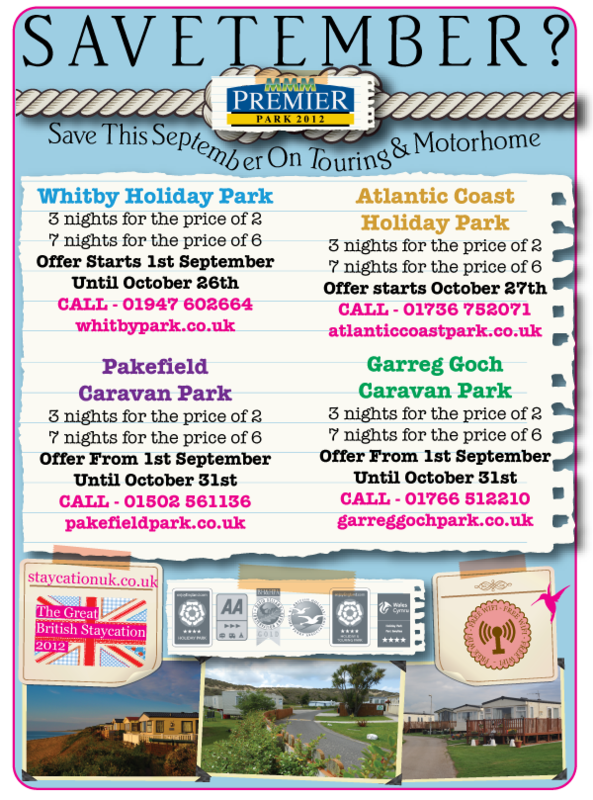 Book for 3 nights or more during September and October and receive 1/3rd discount on the pitch price. This discount will be added automatically if booking online. For telephone bookings, please quote promotion code GG3FOR2. Please note this applies to pitch price only, all extras will be charged as normal.